August 3, 2016: Here's a "Word Attribute Puzzle Solver" which uses predefined rules to apply predefined "letter sets" to a given set of phrases (names in the left column this case) with unknown common characteristics. Rules could include attributes of the words or letters such as syllables, alphabetical order, alphabetical letter position, vowel/consonant categories, letter shapes, or ???. The objective is to find a rule/letter set combination which applies to all of those phrases and to a single phrase in a second list of solution candidates. 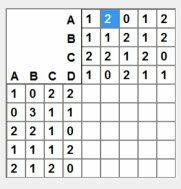 I peeked at the backside of this calendar page to get the solution and coded the appropriate rule for this puzzle, but the program might provide a platform for me to do better with future puzzles of this type. August 29, 2016: Either the projects are getting harder, I'm getting busier with non-coding projects, or I'm just getting slower with age. Probably all three. 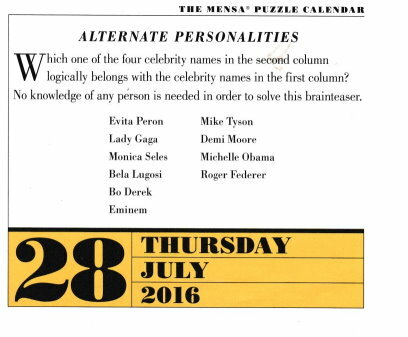 In any event, here's a puzzle from the August 11 Mensa Calendar page that occupied a couple of hours a day for the past 2 weeks: Mind Your ABCDs requires placing those 4 letters in a 5x5 grid with the number of each letter in each row and column as specified in this diagram. There is an added restriction that the same letter cannot appear in two adjacent cells the the same row or column. The program allows user play with counts updated as letters are placed. There's also a Solve button that was the fun part of creating the project.